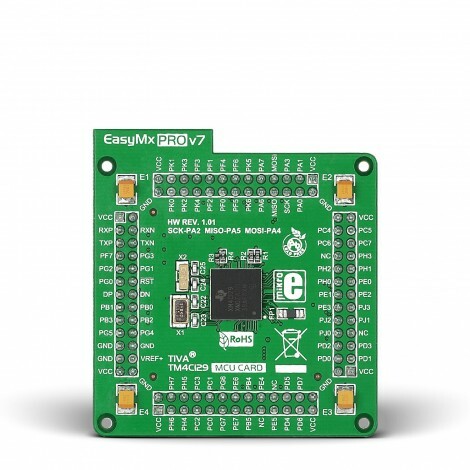 The Default MCU card that comes with the EasyMx PRO™ v7 package. It contains TM4C129XNCZAD microcontroller which is loaded with on-chip modules and is a great choice for both beginners and professionals. After testing and building the final program, this card can also be taken out of the board socket and used in your final device. 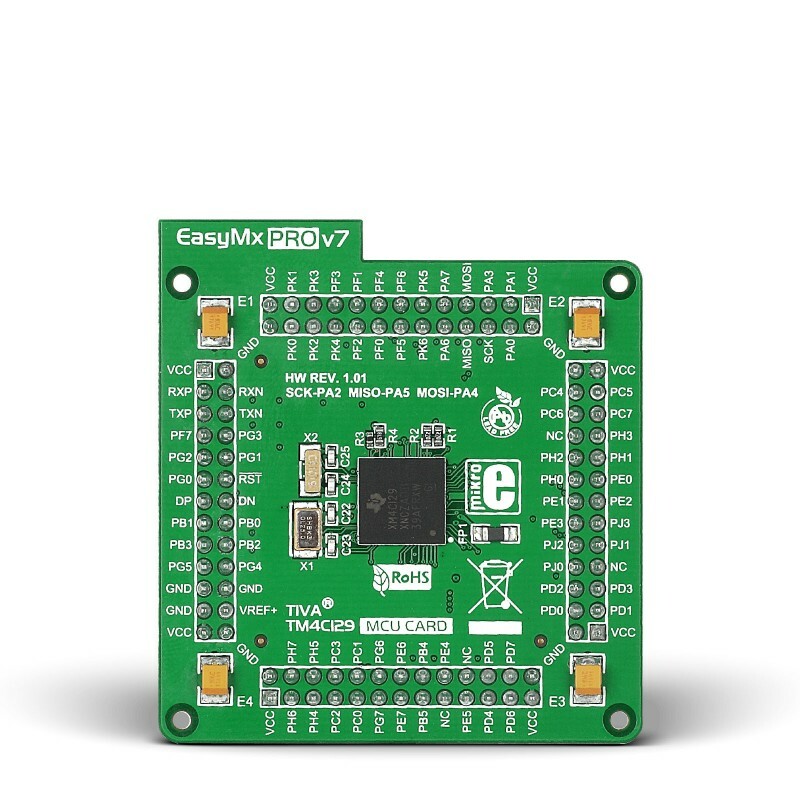 TM4C129XNCZAD is the default chip of EasyMx PRO™ v7 for Tiva™ C Series. It belongs to ARM® Cortex™-M4F family. It operates at 120MHz, has 1024 KB of Flash memory, 256 KB of single-cycle System SRAM, integrated Ethernet controller with PHY, USB 2.0 (OTG, Host, Device), 140 General purpose I/O pins, 7x16/32-bit timers, 2x12-bit A/D (24 channels), a 12-bit D/A , 8xUARTs, internal Real time clock (RTC), 10xI2C, 4xSPI and 2xCAN controllers. It has Serial wire debug (SWD) and JTAG interfaces for programming and debugging. 25MHz crystal oscillator. We carefully chose the most convenient crystal value that provides clock frequency which can be used directly, or with the PLL multipliers to create higher MCU clock value. MCU card also contains 32.768 kHz crystal oscillator which provides external clock for RTCC module. 32.768-kHz external crystal oscillator which provides external clock for the internal hibernation module.